A couple short months ago, a TSN story from Rick Westhead indicated that, once again, discussions regarding placing advertisements on NHL jerseys is something the league would consider. At this juncture, it appears that the only thing holding the front offices back is the unwillingness to be the first major league to do so stateside. 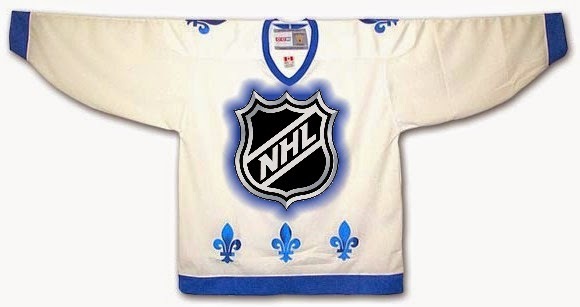 According to a league executive, sponsorships on NHL jerseys are even closer than originally thought. The estimated $4 million per team this move would bring sounds great on the surface, but is that really what fans would want to see? Obviously not. This is an emotional argument to its core. It's an argument based on tradition, which the league claims to value above nearly all else. The arguments centered around practice jerseys and Reebok's logo being quite visible on the game jerseys are weak at best. Certainly, the league and its franchises would enact sponsorship guidelines if/when this venture were to be enacted, but the following are 30 examples of what could happen if this were to become a thing. Remember how the Anaheim Ducks came to be? The NHL and hockey, in general, was gaining huge momentum for a number of reasons that included increased TV exposure coupled with excellent marketing. The success of The Mighty Ducks in theaters led to The Walt Disney Company’s attempt on capitalizing on that momentum to found the Mighty Ducks. Unfortunately, as Troy Loney, former Penguin and Mighty Duck and current co-owner of the Youngstown Phantoms (USHL), said in a Phantoms press conference, the organization was run more like an entertainment venture than a hockey organization. While Disney sold the team in 2005, that doesn’t mean they wouldn’t jump on the opportunity to promote their next film with a gimmicky uniform. The team just changed their name and ownership, so there’d be nothing wrong with a uniform change in this case, right? The problem is that, despite residing in what is considered one of the top 5 television markets in the United States, the team itself can seem to maintain interest, let alone money. The coldest, hardest fact about marketing and advertising is that a company will not sink money into a product or market that actually has very little potential for effectiveness. There is an “official” everything in the professional sports world. Official hot dogs. Official supermarkets. Official car dealerships. Official paper clips. All that “official” is bound to end up causing official headaches when it comes to sponsorships. Offering up individual team sponsorships could end up presenting more conflicts of interest than already exist, especially in the ultra-competitive beer market. Even beyond the obligatory Pumpkin Harvest Spiced Ale season which would bring about even “more special” special jerseys. At a certain point, the sponsor could mean more to the identity of the team than the actual team. 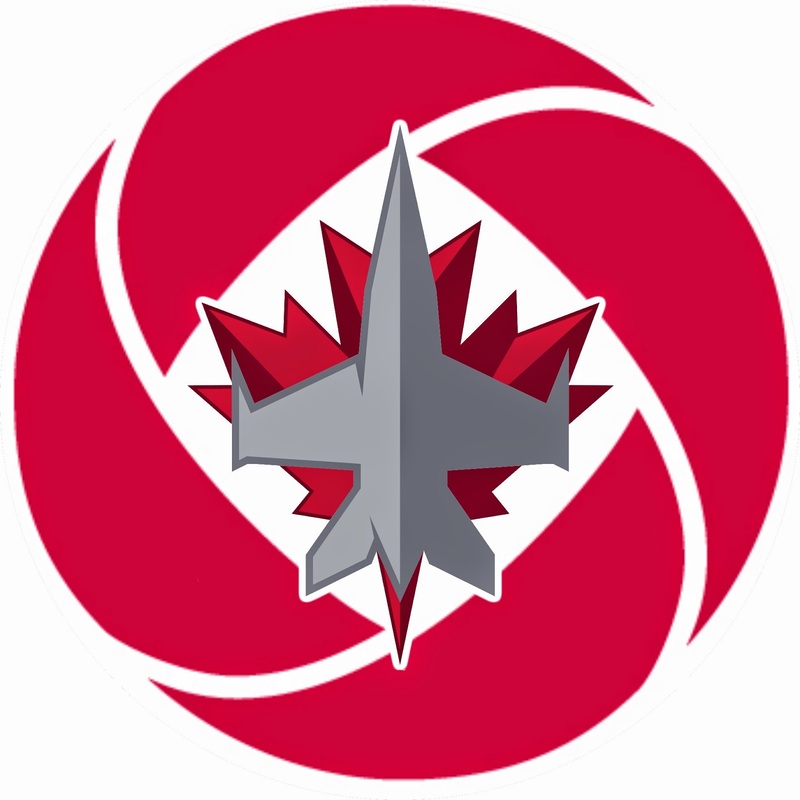 Assume for a moment that a team gets sponsored by a company whose name is amazingly compatible with the name and specialty of the sponsor in question. Eventually, the benefits of the sponsorship will be outweighed by the cost of a team losing what it has left: its identity. Not all markets are the same. 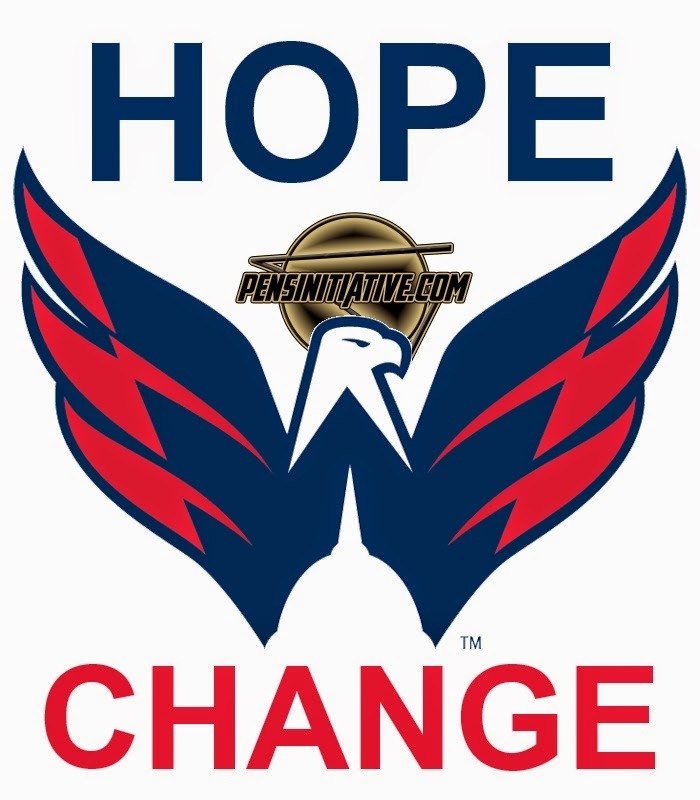 If they were, every team in the NHL would hover around 93% arena capacity. They’d all have payrolls stretching the salary cap’s limits. The difference between first and last place in each division would be exactly the same as the difference in amount of luck a team experiences. I’m sure Raleigh, North Carolina is a great place but I would imagine they’d be pretty low on the list of teams the major advertisers would be trying to gain exposure with. 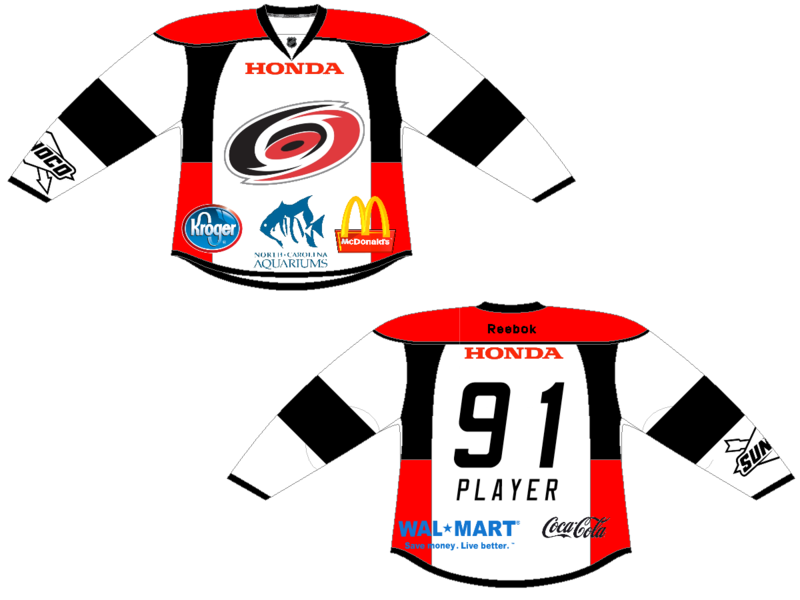 And just imagine what NASCAR country could do to an NHL jersey. Rogers Communications basically owns Canada. At the same time, it is because of the mega-company that the NHL’s salary cap is expected to jump at least $5 million next season. They own exclusive television rights to the NHL in Canada and that is a big deal. Any team that they would sponsor would be sure to benefit from that relationship in a big way. There is always the possibility that another major sports league would want to increase their exposure by reaching out to an NHL franchise. In Pittsburgh, the athletes themselves often cross the sports barrier and offer support to each, which is a pretty awesome gesture. Who’s to say an embattled franchise wouldn’t want to do the same? If the Chicago Cubs, one of the most recognizable franchises in baseball, were to reach out to their neighbors down the way, it could be another 120 years before the Blackhawks could raise the Stanley Cup. And, yes, that would be bad. Even outside of Chicago. Sometimes the potential sponsor is just so easy to predict. And some CEO’s are notably not the most creative people. So terrible decisions will be made regarding sponsorships because “it’s so obvious.” Sure to see a Chevy Avalanche on an Avalanche sweater would be amusing. But, be honest, would hearing the play-by-play and color analysts (who we all recognize as the most creative group of people in the world) utter “He looked like a deer in the headlights. Get it, Bob. In the Headlights? 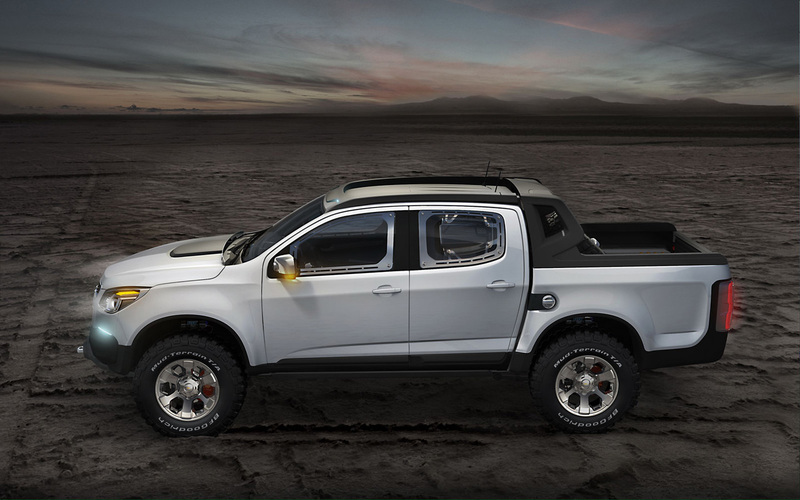 Like…in a Chevy Avalanche’s headlights?” really make for a great telecast? Of all the franchises that could have this jersey advertising blow up in their faces, the Blue Jackets have to be right up at the top. The NRA and gunmakers would love to get exposure to their causes and products, I’m sure. And what better place for a firearms manufacturer to advertise than with a team that celebrates goals with a cannon! But no matter what side of the fence you sit on whatever issue it may be, introducing controversial topics into a sport, which by definition is supposed to be a form of escape from the real world, would be a terrible idea. AUTHOR'S NOTE: I did not choose the gun issue or commentary in this portion for any reason other than the fact that CBJ has a cannon. Which is awesome. As is freedom. And responsible use of freedom. Unlike the Chicago Blackhawks example used above, the Dallas Stars being sponsored by the Dallas Cowboys would be what would happen if a major player with major money and a major ego decided that, because another team in “his” city used a similar logo or theme in “his” town, he should hijack it in the easiest way possible. Who would sponsor the Red Wings? You know that eventually, a short-sighted marketing firm and all of its hundreds of employees will make a huge gaffe. A huge, glorious, gaffe. A gaffe that will be remembered for generations. All because of money. During the Gretzky/Messier/Kurri days, Edmonton was the center of the hockey universe. It’s players were featured on magazine covers, The Hall of Fame is littered with their players now. That was hockey’s Golden Age. Imagine what history would say if Rogers Communications (who we already established as the de facto owners of Canada) had their logo plastered all over each of those moments. Remember the special interest groups I mentioned earlier? 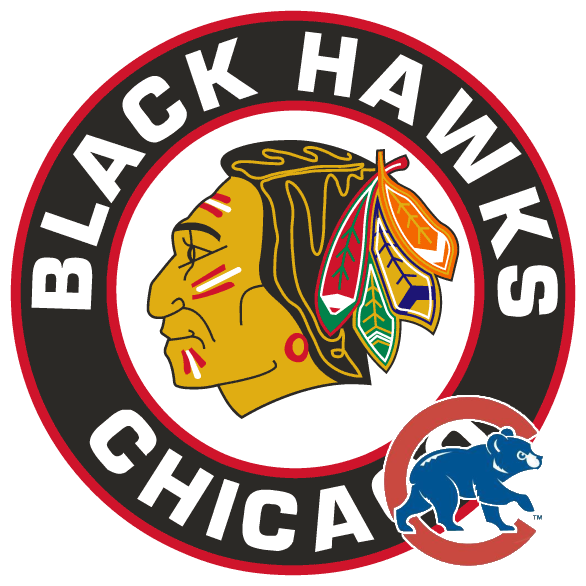 People for the Ethical Treatment of Animals would seem a great fit for the team named after a powerful, majestic creature like a panther. Of course, PeTA could find a way to get as many animals on that jersey as humanly possible. Beyond the jersey, how far could an advertiser’s influence reach? The removal of all meat product from the vendors’ menus? Relabeling the PK efforts as “Kill Penalties, Not Nessie Penalty Kill”? Los Angeles is the home to glitz, glamour and self-righteousness. Hollywood is populated with people whose entire lifestyle is based on their ability to pretend to be something they’re not. And they make a lot of money doing it. Unfortunately, they also like to pretend to be experts in a large variety of subjects and would gladly part with some of their hard-earned money to sponsor a team on behalf of whatever cause they decide to take up. Minnesota is the State of Hockey. They’ve earned that moniker. Of all the cities in North America, Minnesota/St. Paul would be the one that would fully embrace the idea of celebrating their local college’s NCAA success by advertising….or would it be recruiting….on a national stage on an NHL level. Honestly, though, I’m not sure if that would be good or bad. I hate the Habs. You should hate the Habs, too. Everybody should hate the Habs. Just do it. It’s the coold thing to do. But those sweaters are iconic. They should be treated with as much reverence as the Holy Grail itself. Only those worthy enough to change that uniform should be allowed to do so. And with all due respect to the fine folks at Reebok – and at the NHL offices, for that matter – there is nobody at either of those offices worthy of making that call. Tourism is the name of the game in Smashville. Unfortunately, there’s nothing that a taxpayer appreciates more than watching their federal, state and local government spend money on things that they don’t necessarily support. Hockey, for all of our love of the sport, simply doesn’t have the amount of support that other sports or events would have in Tennessee. That doesn’t mean the Nashville Chamber of Commerce wouldn’t relish the opportunity to attract more visitors to Music City. Remember these hideous abominations? All it would take to bring these babies back would be the wrong sponsor at the wrong time. Stay away Gorton’s Fish Sticks. New York City is known for a lot of things. Most of what happens in The Big Apple actually happens away from Madison Square Garden. Many people in social media may love a Cats jersey (including many Pens Initiative writers), but to most people that wouldn’t work. Nothing would be more challenging to journalistic integrity than if a local sports team “got in bed” with one local media outlet or another. It would have the potential to damage the overall coverage of the team as media companies could object to allowing images of the home team’s jersey to be shown in their paper or newscast, lest their competitors get free advertisement. Plus, the Ottawa Sun is a joke and limiting people’s awareness of their existence is probably best for the sporting community. The internet is full of trolls. And if there is one team that could somehow provide focus to a group of internet trolls who would eventually set up a kickstarter to make, say, a “1975” jersey happen, that would be the Flyers. The mere idea of an Orange and Black jersey with “1975” emblazoned across the front could very well be the only thing that could ever bring true harmony to Rangers, Pens and Capitals fans. The title of Greatest Dasher Board Advertisements I’ve Ever Seen belongs to Dunkin’ Donuts for their “Boston Brewins” campaign. It is creative, punny, and right in front of the team benches so that it was always there to see. While I would love to see a similarly punny “Let’s Go Pens” advertisement from Bic, a team jersey is not where it needs to be. Stick to the boards and the ice surface, please. Speaking of puns, a certain team in the Silicon Valley could probably starting a FEEDING FRENZY over the advertising for their duds. Basic cable companies would SMELL THE BLOOD IN THE WATER. Discovery has fed off the cash COW that is Shark Week for years. Sharknado is still a PUP but SyFy knows the value of advertising. Or the two might form a HERD. One channel would sponsor the GREAT WHITES. The other would sponsor the home darks. Either way, I’m afraid a proverbial shark has just been jumped…. St. Louis is famous for a great number of things. It’s the Gateway to the West. The home of Anheuser-Busch. Maya Angelou was born there. Ice cream cones were invented at the World’s Fair hosted by the city. It’s considered the “Home of the Blues,” hence the name of the local hockey club. 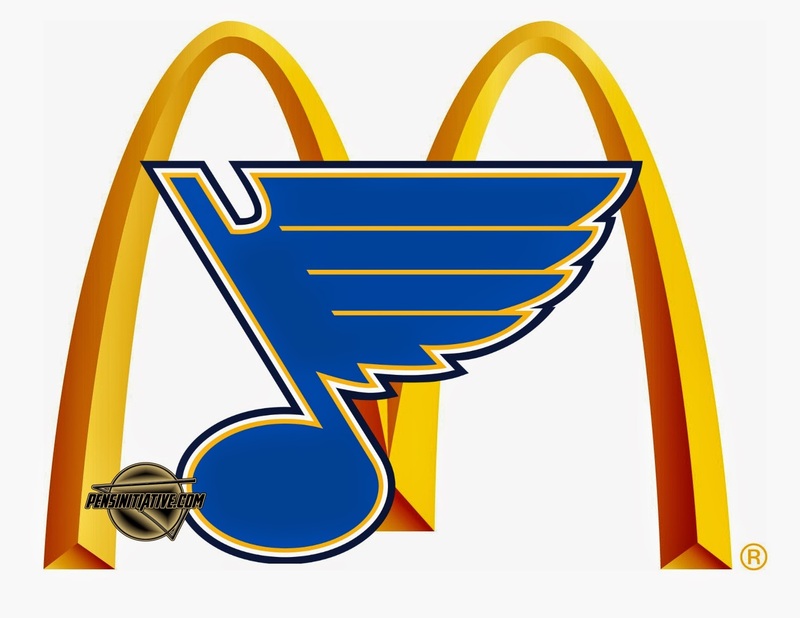 Unfortunately, a company like McDonald’s would likely jump at the chance to have their logo incorporated into the Blues’ uni. It’d be a natural fit given the Gateway Arch. Plus it’d be the perfect way for the fast food chain to sling those terrible McRib sandwiches to a city known for its barbecue. EASports is the devil, but they know how to market. The Lightning, would seem to be a pretty good fit with uber-talented Steven Stamkos being one of the more recognizable and universally liked stars of the game today. I genuinely feel bad for Leafs fans. Tickets to see a game in Toronto are notoriously over-priced and difficult to obtain. The hockey culture there has been overrun by corporate types that don’t necessarily take as much of an interest in the game itself as they do the status that goes along with attending a game. It’s easier for fans to invade other arenas than it is to see them at home. Adding a corporate logo to the traditional Leafs sweater would merely be salt in the wound. Our nation’s capital is ripe with greed, corruption and strife. It is the temporary home of many politicians looking to keep the power vested in them by the American people. It wouldn’t be a stretch to believe that these pols wouldn’t show interest in reaching the potential voters in the Verizon Center and beyond. Remember how we said that Rogers Communications owned Canada? And then repeated it? Just making sure you remembered. 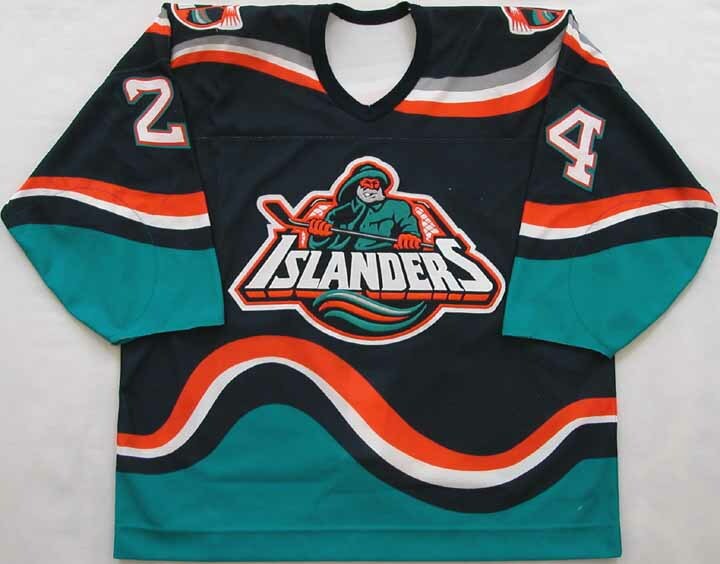 The Canucks have historically had terrible uniforms. We’re talking ugly with a capital F. They may actually benefit from accepting a Design-The-Uniform campaign agreement from a local museum or Art school. But who are we kidding? They’d probably end up sponsored by Canadian Tire. Sorry, you got it wrong, The Ottawa Citizen is the joke paper here in Ottawa.